Since bringing your child home, have you encountered behaviors like hoarding, food obsession, overeating, selective eating, or faced sensory challenges that impact feeding? Do you encounter picky eating and power struggles on a regular basis, and find that you dread dinnertime? Join Katja Rowell, M.D., aka "The Feeding Doctor," to ask questions about the challenges you've faced at meal or snack times.during Adoptive Families' Adoption Expert Q&A Webinar: Love Me, Feed Me on February 7, 2013 from 1PM to 2PM EST. Submit questions in advance by posting a comment below. Katja Rowell, M.D., aka "The Feeding Doctor," is a family physician who works with parents to establish healthy feeding relationships by focusing on the how of feeding. She has developed a special interest in supporting adoptive and foster families with feeding and weight worries, and recently published Love Me, Feed Me: The Adoptive Parent's Guide to Ending the Worry About Weight, Picky Eating, Power Struggles and More. 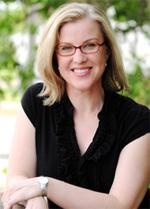 Rowell is a sought-after speaker, blogger, mother, and family cook. See the full lineup of upcoming Adoptive Families webinars and listen to recordings of past sessions. My daughter is 6 and she has a limited variety of foods she will eat. She was adopted from China at 15 months old and refused all solid food for more than a year. She was developmentally delayed and extremely orally defensive. She is now in feeding therapy with a speech therapist and is making some progress. She is working on strengthening her jaw muscles and tongue mobility. She has a hard time moving her tongue up and forward. She has no difficulty with swallowing. She has 50% of her nutrition from a bottle which contains a jar of baby food and milk. Although she can use a cup and a straw, she is very rigid in her thinking and won’t drink the bottle contents out of anything else. It’s hard to condense her history. What is the best way to help her eat more and get off the bottle? I also need to add that she was physically abused in the orphanage and is very fearful of new things. By SA106 on Tuesday, February 05, 2013 at 2:44 pm. My 12-year old daughter was 2 years old when we adopted her from an orphanage in Bulgaria. She was always challenged with eating fruits/vegetables, but we always managed to get her to eat a fairly balanced diet and she has improved. Over the years we have found evidence of sneaking food - candy wrappers, dirty spoons, empty containers, etc. hidden away (under furniture, in drawers, planters . . . . We have never restricted her access to treats since we didn’t want them to seem more appealing, and we allow her snacks if it won’t interfere with meals. She has an athletic build, so she hasn’t had to worry about her weight, which of course, could change. She claims she sneaks when she’s hungry (usually after a meal she doesn’t want). I don’t want to turn into a short-order cook and prepare a separate meal for her, and we don’t want to eat pasta & carbs every day. We encourage her to eat in the kitchen whenever she gets hungry since we don’t want her eating elsewhere, but we continue to find evidence around the house. We even got her the yogurts with the stir-in crunchies to make that a more appealing snack. I found the yogurt containers (untouched) behind my microwave oven when I was cleaning. Of course, the stir-ins were gone. We recently brought home 2 sisters for her and they are not challenged at all. We’re at our wit’s end. By BulgariaMom on Tuesday, February 05, 2013 at 4:01 pm. My daughter was only 1.6 kilograms at birth. She weighed 15 pounds @15 months when we adopted her. Lately, we have been trying to introduce some new foods. We run into big problems if she gets hungry because she will start raging. We are trying to get her to eat before filling her up with her bottle(same child as first question above), but we run the risk of her getting too hungry and her thinking we are not going to give her food. Where do we find a balance? By SA106 on Thursday, February 07, 2013 at 4:00 am. Is the approach to feeding therapy different when a child is orally defensive because of abuse, and is there a way to determine if a child has been force fed ? By SA106 on Thursday, February 07, 2013 at 4:09 am. I have a six-year-old client who was adopted at fifteen months of age. The parents believe that there was some sort of oral punishment at an early age. She still consumes three seven ounce bottles of milk with baby foods everyday for nutrition. She eats a limited amount of foods ranging in texture. She showed varying strength and sensory concerns at the initial visit, however I was unsure if the jaw strength was a matter of fear than strength. At the first session she was resistant to oral motor exercises, but is now tolerating all oral motor exercises without protest. She continues to show hesitancy when she bites on chewy tubes, but is doing better. She will now allow the spoon to touch her tongue and lips. She tends to inspect her food visually and by smell. During therapy she will trial new foods and agree to try varying foods/utensils/spoons at home, but then isn’t willing to follow through with her parents. We are afraid to push her too much and completely turn her off, but unless she is willing to work at home for mom and dad success won’t come quickly or at all. The goal at this point is to get her off the bottle feeds. We have tried special cups, straws, rewards etc. What should my next step look like? Also, should we consider talking with her about why she feels afraid? She typically will give an “I don’t know” answer when questioned as to why she doesn’t want to eat something. By lochance on Thursday, February 07, 2013 at 4:37 pm. I am in the process of adopting my 11yr old niece and 6 yr old nephew. My niece has been in my care at least half of time since she was 5ys, but my nephew wasn’t allowed to come with me when my niece did because of the fact that he wasn’t my blood nephew. Anyway, they have lived with me for over 1 & 1/2 yrs. My nephew was 85lbs at 5yrs old and his diet that he was used to consisted of milk, chips, and peanut butter and jelly. He wasn’t even able to dress himself, bathe himself, and had never been socialized with other children. Everything happened under emergency circumstances of course and he isn’t always happy about living with me. Ive had standby guardianship of my niece since she was 5yrs old and have been a consistent figure in her life so, my concerns aren’t for her because she is very open with me. My nephew has made major milestones in development, but the one area that remains consistent is the food hoarding issues. I have a parenting coach that helps me, but sometimes I still feel my hair falling out. I’ve implements the snack basket that his can keep in his room and can come to me to get it refilled when needed. It seemed to work for a little while, but the issue is that the rest of the family seems to feel like a prisoner to the food hoarding because now my daughter and niece feel like they have to hide their food that they might buy at the store for their selves because he will eat every last bit of it during the middle of the night. All food is available and nothing is locked up because I know that only makes it worse. He is only 6yrs old and now he is even stealing their money out of their banks in their room,when he has his own that is available to him. He has sensory issues as I have to slowly integrate items into his room. This was quite a learning curve for me because I had his toys in his room but all that did was make it where he would have tantrums and throw and break things so, I moved all of his toys in to the playroom and the bedroom is for sleeping and reading now, which seems to be going well. He is constantly battling me for control of every situation and all I want to do is give him what he so desperately needs. What makes matters worse is that things were seeming to go well and progressing forward until his mother passed in April this year and now we are in a regression period. Finally, I got respite care started because being a single mother to 3 kids under 12yrs old is quite a feat in itself, but I feel that once I get a needed break to regroup, I will be more prepared to help him through this rough time in his life. Any positive advice is appreciated! By HH88 on Friday, June 22, 2018 at 11:02 am.